Jenny Bean: For the Parlor Part 5 Verse [H6608] - $8.00 : Yarn Tree, Your wholesale source for cross stitch supplies. Cross stitch pattern by Shakespeare's Peddler. 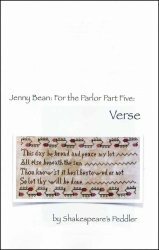 We welcome part five of the "Jenny Bean: For the Parlor" series with "Verse." The verse reads, "This day be bread and peace my lot, All else beneath the sun, Thou know'st it best bestowed or not, So let thy will be done." Above & below the verse is an elegant pink & red border. Collect all eight in this series to stitch Jenny's entire sampler. Stitch count for this part is 170 x 100. Stitch count for the entire sampler is 810 x 170.